The Chief Minister of the Northern Territory, the Honourable Michael Gunner MLA and Member for Arnhem and Assistant Minister for Remote Education Ms Selena Uibo MLA recently visited Numbulwar School. This was a great opportunity for the Chief Minister and Member for Arnhem to witness first-hand how key initiatives of the Indigenous Education Strategy are positively affecting student outcomes. The visit included observing a Direct Instruction class and speaking with teachers about the program and how it has helped improve the delivery of literacy learning to their students. The students were extremely excited to welcome the Member for Arnhem back to the school where she was previously working as a teacher and show her the progress they have made in their learning. The Nhulunbuy Residential Facility is on track and looking fantastic as construction continues to progress. Members of the Indigenous Education Review Implementation team and I visited Nhulunbuy High School and worked with the Principal on ensuring all preparations were in place in the lead up to the opening of the facility in January 2017. As part of the visit to Nhulunbuy, we toured the new site to see the progress of the build. I am extremely pleased to report that the architects and builders have really captured the design that was envisioned by key stakeholders almost two years ago. As we continue to implement the key actions of the Indigenous Education Strategy, it is important to recognise the great work that is going on as new programs and policy are being rolled out for our schools and regions. I appreciate the many hours and hard work that this involves. It was very heartening to see the Transition Support Unit has been shortlisted as a finalist in the 2016 Chief Minister’s Awards in the category of Innovation in the Public Sector. Congratulations also to FaFT educator, Kara Blair who was announced as a finalist in the category of Emerging Professional Educator at the 2016 Northern Territory Education and Care Awards. Learning together is the focus for 30 children, their mums and families at the newly established Families as First Teachers (FaFT) program in the Daly River community of Nganmarriyanga. Although the program only opened a month ago, FaFT Educator Meg Hewett and Family Liaison Officers Renee Modikan and Rachel Luckan are delighted with the eagerness and excitement that the community has shown for the program. 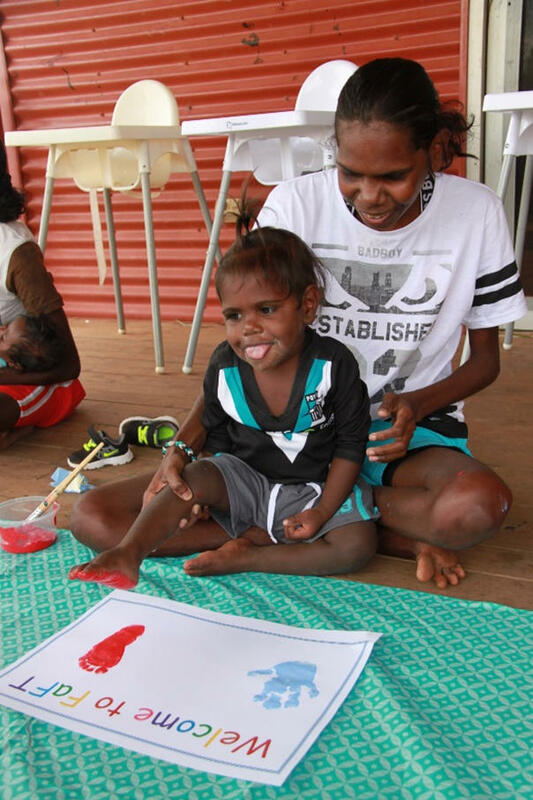 For the first term, the mums and their ‘school kids’ have had a strong focus on Conversational Reading and enjoy using both English and their traditional language, Murrinh Patha in learning. “The mums have created portfolios for their children where they can track the learnings and progress. Each week they put a photo in it and write a message which helps develop the parent’s literacy skills and confidence” Meg said. FaFT participants at Nganmarriyanga have even created a song and video that tells their experiences with the program so far that you can view here. FaFT currently operates in 28 communities across the Territory including the new sites at Alparra, Arpurrulum and Barunga. To find out more about our FaFT programs please contact Regina Thompson, Director Families as First Teachers on 08 8999 3520 or at regina.thompson1@nt.gov.au. 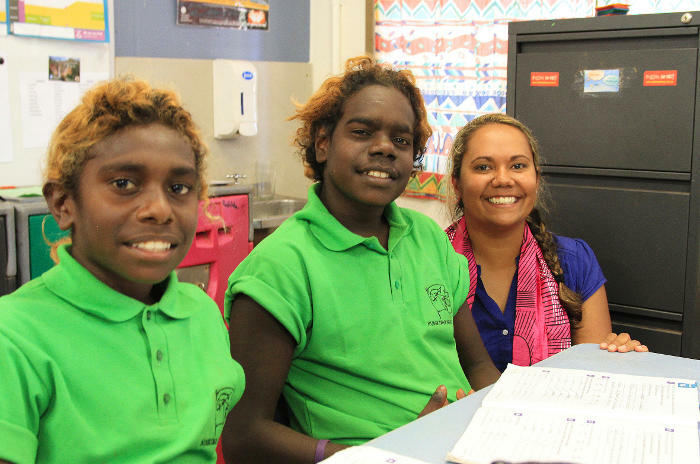 Making every day count for students in the Katherine region has become a little easier with nine new School Attendance Coordinators employed at Ngukurr School. Comprising of members of the community, the Remote School Attendance Strategy’s (RSAS) School Attendance Coordinators work as a conduit between the community and the school to maximise attendance at school and identify the barriers for students and families. In some locations this involves assisting students with how they get to school, helping organise school lunches as well as talking to students and families about the importance of regular school attendance. For other schools where RSAS has been in operation for over a year, the benefits of the program and the attendance officers are evident. In the Arnhem communities of Bulman and Barunga, attendance has increased by 23.4% and 20.3% respectively since Term 3, 2015. To find out more about our attendance programs please contact Suzanne Kendrick, Director Enrolment and Attendance on 08 8944 9369 or at suzanne.kendrick@nt.gov.au. The Indigenous Education Strategy’s commitment to student engagement is central to improving student attendance and outcomes. The Stars Foundation and Role Models and Leaders Australia run engagement programs specifically targeting young Indigenous women. 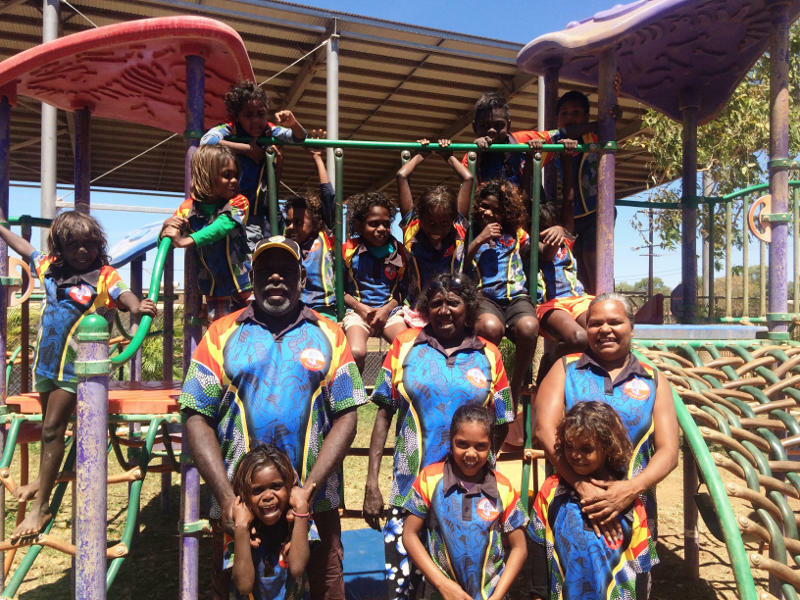 Operating in 13 sites across the Territory, the programs focus on attendance as well as educational outcomes and health and wellbeing of the students. Through various workshops and activities, students are provided with opportunities to develop and grow personally, and engage with their schooling. The Stars program achieves this through community involvement and support. 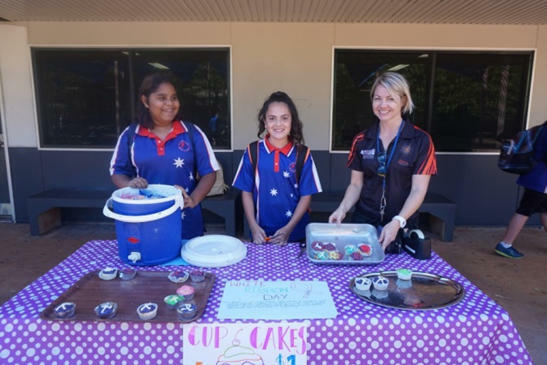 Middle school students from the program in Katherine recently organised a cupcake fundraiser for White Ribbon Day. Students baked cupcakes, made posters to promote the event and assisted with the sales on the day, building their skills as a team and individually. The fundraiser was a success for the students and all money raised was donated to the Katherine Women’s Crisis Centre to support the important work that it does. To find out more about our Girls Engagement programs please contact Susan Considine, Director Careers and Engagement on 08 8944 9355 or at susan.considine@nt.gov.au. After four years of hard work and study, former Assistant Teacher Marie Ryder is set to graduate with a Diploma of Education. 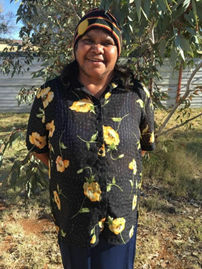 Starting her educational career in Mulga Bore in 2003, Marie really enjoyed working and contributing to the school community where all her seven children were attending. While working at Mulga Bore School, Marie took advantage of the professional development opportunities available for Assistant Teachers and completed a Certificate IV in Education Support with the Batchelor Institute of Indigenous Tertiary Education (BIITE). As part of the Indigenous Education Strategy’s commitment to enhancing professional development opportunities for Assistant Teachers, the Department of Education and BIITE have created a professional learning and development framework. Through the framework, Assistant Teachers can link their learnings to professional standards and use that information as credit for additional studies including tertiary education. “I felt really lucky to have all the support that I did to complete my studies”, Marie said. “The lecturers at Batchelor would visit the school to tutor me and Jane Crossley [previous Principal Mulga Bore] and Dave Oke [current Principal at Mulga Bore] supported me when I went to Alice Springs to attend workshops”. Although Marie has now retired from her Assistant Teacher position at the school, Principal Dave Oke is sure she will continue to have a role in the school community. “We’ve really appreciated having Marie in our school,” Dave said, “and I know she is a great role model and will continue to make a difference here through mentoring and supporting our Assistant Teachers”. If you would like to find out more about development opportunities for Assistant Teachers please contact Maree Melican, Workforce Services Manager on (08) 8944 9378 or at maree.melican@nt.gov.au. 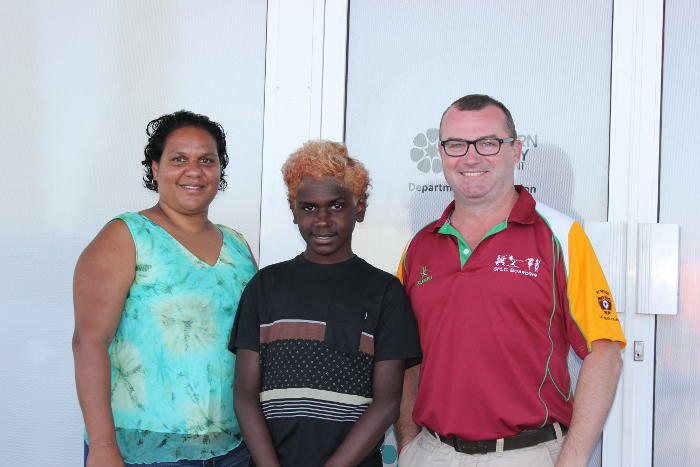 Ten Indigenous students from eight remote communities across the Northern Territory have been offered places at high performing interstate boarding schools next year as part of the Transition Support Unit’s (TSU) Indigenous Education Excellence Scholarship. The Scholarship Selection Committee was delighted to receive so many applications this year. “We were really excited by not only the number but the standard of the applications that we received this year” TSU Senior Manager Boarding School Relationships, Gaynor Manning said. Applications have increased this year which could be attributed to the Transition Support Unit staff who have been specifically working with 533 Year 6 and 7 students and their families in remote communities to discuss options for secondary schooling in 2017. Shortlisted students and their families were invited to visit the Transition Support Unit offices in Darwin and Alice Springs to meet with the representatives from the boarding schools. “While it was important for the schools to interview the candidates to see if they would be suitable for boarding opportunities, it was equally important for the students and their families to feel comfortable with the situation” Gaynor said. “We encouraged the students and families to ask as many questions as they wanted and at the end of the day we felt that everyone was really happy with the process”. Shortly after the interviews were conducted, visiting boarding school staff advised that all students that had been shortlisted would be offered places for 2017. If you would like to know more about the TSU Indigenous Education Excellence Scholarship please contact Brenton Toy, Senior Transitions Manager on 08 8922 2127 or at brenton.toy@nt.gov.au. 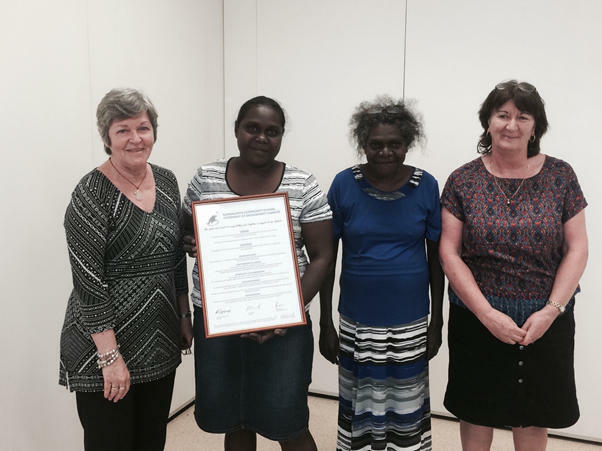 Congratulations to Esther Djayhgurrnga and Sue Trimble, co-principals of Gunbalanya School on working together with the school council chair, Daisy Brown and their community to complete their Engagement Charter. The charter reflects the fantastic work that Gunbalanya School already has in practice when consulting with the community. The purpose of the charter is to display the school’s commitment to the community and highlight the importance of working together for the good of the students. The framed charter was presented to the school by Marion Guppy, Deputy Chief Executive, School Education on Monday 12 September 2016 as part of a recent trip to Gunbalanya.